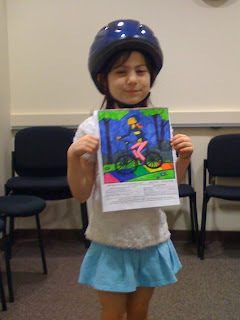 A couple of months ago school sent home a picture to color as part of a bike safety awareness campaign. We sent it in, never expecting to hear about it again, but then one day we got a letter in the mail saying Genevieve had won second place for her grade. The prize was a personally fitted bike helmet. Wow, how cool is that? She was SO amazed and proud of herself. Aaron hit a big milestone yesterday. 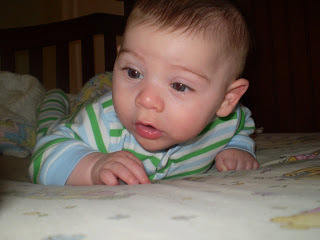 Lately he's been trying really hard to roll over from back to front but hasn't had too much interest in the other direction. But yesterday he was lying on his tummy in the crib crying and was holding himself way up on his arms, so I was like "come on, you can do it!" and all of a sudden he flipped himself over. He looked stunned for a minute, then broke out into a huge grin. Of course this means I can't leave him anywhere he could roll off anymore. 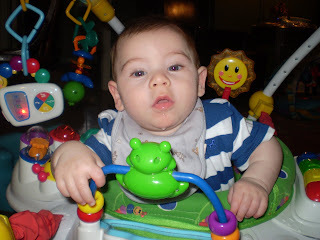 So starts the "mobile baby" phase... They grow up so fast!